The bodies of the flight model (left) and engineering model (right) of Curiosity. The flight model will be the rover launched into space, with the engineering model serving as a back-up. PASADENA, Calif.? It may not look like much now, unassembled under silver tarps, but once it's completedand launched, the Mars Science Laboratory will be the biggest, most powerfulvehicle ever sent to the red planet. Theassembly of MSL (recently re-named"Curiosity") here at NASA's Jet Propulsion Laboratory is movingalong slowly but surely ? mission engineers are taking their time now that theyhave two extra years to prepare after the mission's original 2009 launch datewas delayeduntil 2011. Once it iscompleted, the rover will have a complex suite of instruments that can test theMartian surface for signs of past potential habitability, including onboard chemistrylabs and a laser that can zap rocks to determine their composition. There arestill a few kinks to work out, and mission planners want to make sure theyaddress every problem. The roveris "still a really big, complex thing," said Joy Crisp, a deputyproject scientist for MSL. 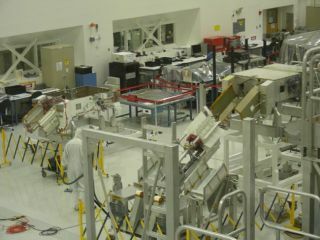 On thefloor of a "clean room" at JPL's Spacecraft Assembly Facility, themetal body of the rover --? destined to be the size of a small car and weigh 2,040pounds (925 kg) -- sits upside-down on a rack, none of its Mars-probinginstruments yet attached. "We'rein the early stages of assembly," Crisp said. The wheelsthat will move the robot across the dusty Martian surface stand upright inmetal crates. Nearby, covered by a tarp, is the huge saucer-shaped heat shieldthat will protect the craft as it plummets through the Martian atmosphere. Theelaborate crane system that will lower the rover to the ground before flyingoff and crashing is on the other side of the room, held up by a metal frame. Men inwhite "bunny suits" carefully vacuum the clean room floor to removeany contaminating dust and slowly move an enormous overhead crane to lift andshift parts around. As thespacecraft is assembled, engineers are testing out all of its components tofind any potential flaws and fix them before the rover is sent on its journeyto Mars. The biggestconcern right now, Crisp said, is the actuators, the motors that control themovements of the rover's wheels, mast and robotic arm. The problem is gettingthe actuators to work at the cold temperatures of the region where Curiositywill land. While the rover's landing site won't be as far north as was thePhoenix Mars Lander's (which landed last summer in the arctic plains of Mars),it will be further north of NASA's two rovers currently on the Martian surface,Spiritand Opportunity. Curiosityis also benefiting from the experience of its predecessors. Last summer, Phoenix had difficulty getting samples of dirt into its instruments because the dirtwould clump together. Curiosity's team is working on ways to get aroundthis problem should the new rover encounter sticky soil. To preparefor this issue, the team is testing Curiosity's instruments with more types ofsoil-mimicking materials, Crisp said. They are also considering installing atest funnel in the front of the rover where they could deposit soil samplesfirst and "see if it jams or goes through," Crisp said. Anotheridea is to use a device like a pipe cleaner that could clear out any clogs.Essentially the team is looking at "things that could be added quite latein the design," Crisp said. Once thedesign is finalized and Curiosity is fully equipped for its Martian mission, itwill be launched and eventually land at one of four sites that is yet to bedecided upon. Once the probe touches down, it will investigate the localgeology, chemistry and the potential for biology, including looking for ananswer to one of the biggest questions: "Are there organics on Mars? "Crisp said.